Visiting the Cuzama cenotes is one of our favorite day trips from Merida, Mexico. The cenotes themselves are absolutely stunning. But what makes the cenotes around Cuzama really unique is the form of transportation to get to each cenote: by horse cart! During our first roam around the Yucatan in 2014, a local guy we had met in Merida highly recommended for us to visit the cenotes outside the village of Cuzama. The cenotes we visited near Valladolid were such a highlight of our trip so far that we heeded his advice in order to explore more cenotes. The man in Merida told us to go to the old hacienda a few kilometers south of Cuzama. His recommendation was quite enthusiastic. So we drove around the rural Yucatan countryside in search of these Cuzama cenotes. A Surprising Ride to the Cuzama Cenotes! After passing several competing cenote complexes all around Cuzama, we finally arrived at the hacienda. Sure enough there was a man there asking us in Spanish if we’d like to go to the cenotes. We had no idea what we were in for. We had figured he was going to walk us to these underground natural swimming holes. Perhaps he would simply point us into the right direction after collecting our fee. So we were a bit confused when he then directed us to two young boys (my guess of their age is 10 and 6). They were on something that looked like a mining cart on rails that was connected to a horse. So we hopped on the cart with the boys and were quickly whisked away on a bone-rattling ride deep into the Yucatan jungle! What a thrill!!! A few kilometers later the niños stopped the cart and motioned for us to get out, then they led us down a path to the first Cuzama cenote. It was a beautiful underground cenote and we didn’t hesitate at the opportunity to swim around in for a while. The boys then walked us over to what simply looked like a small hole in the ground. I guessed they just wanted us to have a look into this cave. After peering over the edge, I noticed an old homemade wooden ladder that vertically stretched down into the pitch black, beyond what I could see. 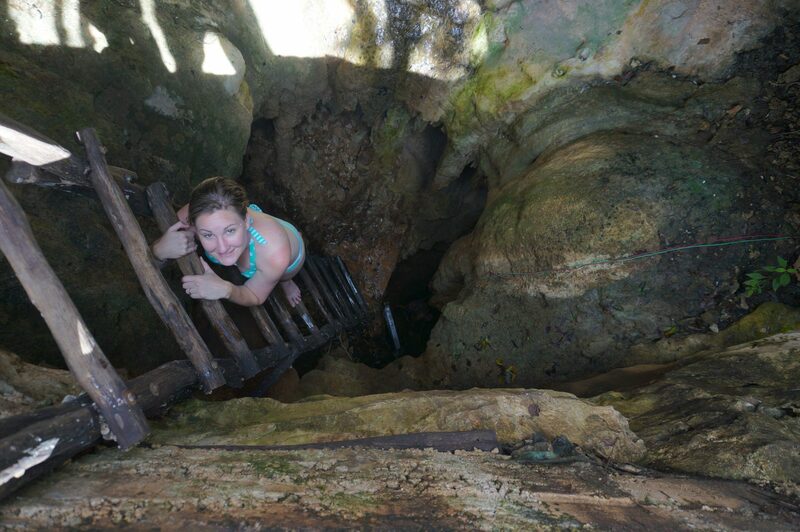 So we proceeded to climb down, found another ladder and continued climbing down into this Cuzama cenote until we reached a pool of water for the splashdown off the ladder! It was, in fact, the second Cuzama cenote! There’s no place to stand. You go directly from ladder to water. To our surprise, once we got to the bottom of the ladder, the underground cenote was beautifully lit. There was a light connected to a generator, which was strung by long extension cords to the surface. Equipped with a mask I had brought, I attempted diving down this somewhat narrow pool of water and after about only 10 feet or so it becomes eerily pitch black. It was disorienting and a bit scary to be underwater in this total darkness. Maybe stick to the surface. This particular cenote was not as visually impressive or picturesque as the other two Cuzama cenotes we visited. But it was a very cool experience to submerge on down into this abyss! It was then back onto the cart. The two boys and their trusty horse pulled us along to the third Cuzama cenote. This was probably the most scenic of the three Cuzama cenotes and it had a nice deck to sit on or jump off. We did the latter. Visiting the three Cuzama cenotes was a great experience that I’m so thankful was suggested to us. We likewise strongly recommend visiting the Cuzama cenotes if you ever find yourself in the Yucatan. 💵Cuzama Cenote Entrance Fee: $300-pesos at Chunkanán Cenotes, described here. $400 pesos per cart at other two Cuzama cenote complexes: X’Tohil and Cuzama. Wear a bathing suit and consider bringing a change of dry clothes to change into. There are life jackets available to rent at each of the Cuzama cenotes but no masks and snorkel. Mask & Snorkel: If you go to the Cuzama cenotes, we strongly suggest packing a mask and snorkel so you can see all the rock formations lit up in this crystal clear water. There are fish swimming around to see too! And although there wasn’t much to see in the black abyss of the second Cuzama cenote we visited on this excursion, there was lots lit up in the other two. Masks were not available to rent. So be sure to pack one. This US Divers Mask is an excellent quality mask for its inexpensive price. Biodegradable* sunscreen is very important to bring if you plan to go into the areas cenotes. Regular sunscreen causes damage to the cenotes, kills the fish, and add chemicals to the fresh water. So please use biodegradable sunscreen, which can be difficult to find in Merida. This Alba Botanica Hawaiian Sunscreen SPF 45 is a great choice on Amazon, has consistently great reviews, and is inexpensive too. Many cenotes around the Riviera Maya are now requiring this or showering before entering. They’re imposing such requirements on at the Cuzama cenotes, so it’s up to you to be a responsible traveler. Natural mosquito repellent. During our last visit to the Cuzama cenotes there were lots of mosquitos and some vicious horseflies too. So if you’re susceptible to bugs bites (like I am), bring some spray. Again, we strongly urge natural products as DEET repellent is really harmful to the cenotes and kills fish. This natural Repel Lemon-Eucalyptus repellent works well, isn’t as harsh on your skin, and better for the environment when you enter those fresh water cenotes all around Merida. It is worth every penny of its $10 price to give you the peace of mind of not ruining your phone. The strap lets you go hands-free too as your crawl down those ladders. There are three completely separate cenote complexes around Cuzama run by three entirely different cooperatives: X’Tohil, Cuzama, and Chunkanán. It is very easy to get them confused with one another. All three Cuzama cenote cooperatives provide similar experiences with a horse-pulled cart ride, yet they simply visit different cenotes. Competition is fierce and you’ll experience people flagging you in as you approach. Since we first wrote about our Cuzama cenote experience in 2014, we’ve been back personally been back to check out another one and found experiences at both to be similarly great. (Update coming soon about the other Cuzama cenote we visited). We’ve also heard the same about the other (X’Tohil). So which of the Cuzama cenotes to go to? That’s entirely up to you. There’s really no bad option. The cenotes at all complexes are fascinating and each have their own appeal. These recommendations may help you to decide. The cenote complex that was described in this article is the Chunkanán cenotes of Cuzama. 🚗 Self-Driving from Merida to Cuzama Cenotes: From Merida Centro it takes about an hour or so to reach Cuzama. Directions are here on Goolge Maps. Those directions take you past the X’Tohil Cenotes, to the center of Cuzama town. Make a right, to head towards Chunkanán. Within a few kilometers you’ll see a Cuzama cenote complex on your right. Another kilometer or so past that is the final Cuzama cenote complex of Chunkanan. You’ll have no problem finding any of the three sites as there are ample flaggers and even kids on bikes directing you. 🚌 Colectivo or Bus from Merida to Cuzama Cenotes: Buses to the town of Cuzama depart the Noreste terminal, located here on calle 67 and 50. The bus to Cuzama costs $20 pesos each way and takes 1.5 hours. The Cuzama buses depart at these times: 7:45, 9:15, 10:45, 12:30 and 14:30 (at last check, times may change). Alternatively there are colectivos that depart across the street from the Noreste terminal on calle 67. 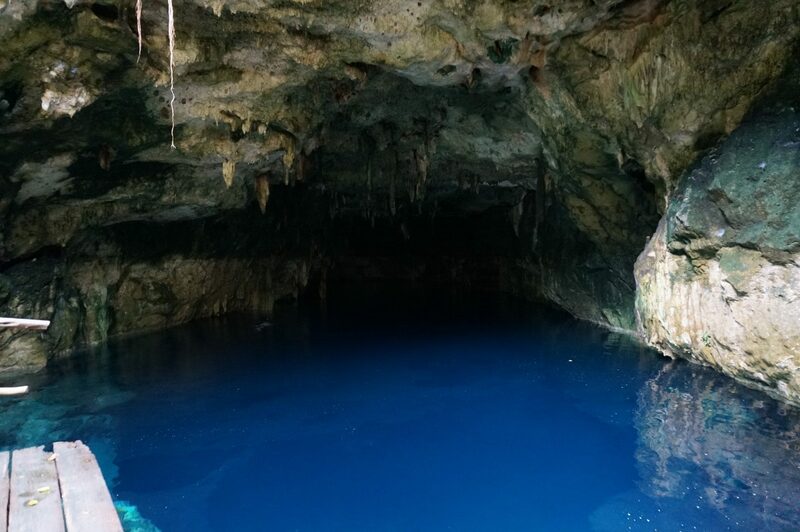 If you are using public transport to reach Cuzama, you may want to ask the driver to drop you off at the X’Tohil cenotes before reaching the town of Cuzama. Otherwise, you’ll need to walk or take a motor taxi the additional 2+ km south of the town, to reach the other Cuzama cenotes. 🚐 Day Tour of Cuzama Cenotes: You can book this well-priced adventure tour to the Cuzama cenotes ($55 USD) that includes hotel pick-up, guide, the horse ride, all entrances, a visit to the town of Acanceh and even lunch too! Check pricing and availability of this Viator tour for your travel dates. 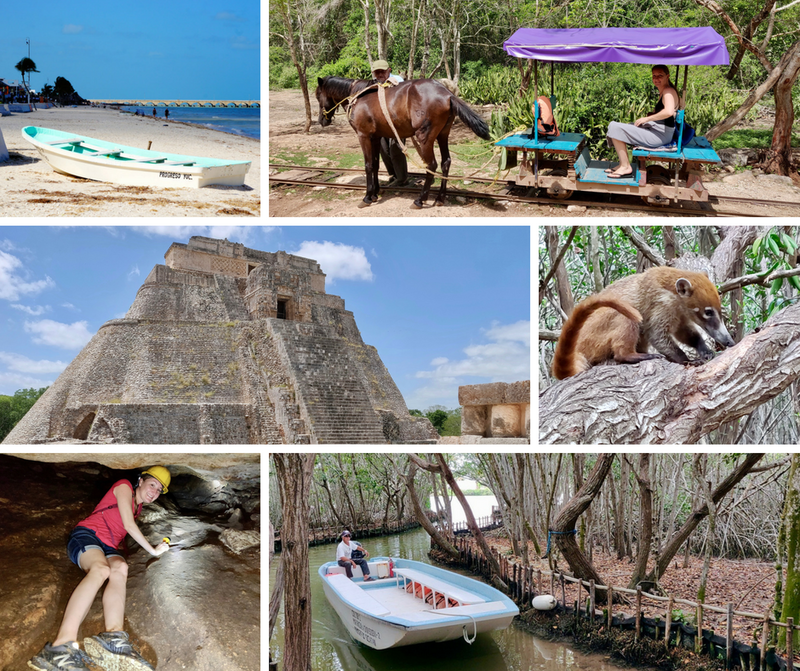 If you’re looking for day trips from Merida Mexico, be sure to check out our big travel guide that discusses the best ruins, beaches, cenotes, caves, and haciendas throughout the Yucatan. And if you’re staying in Merida, check out our other travel guide: Top Things to do in Merida, Mexico. I will be going with my children ages 14, 11, and 8 do they have life vest for children and adults? We actually just went back to these Cuzama cenotes a few weeks ago (and will soon be updating this post w/ additional info). But when we were just there, I can confirm that they do indeed have lifejackets available, for a modest fee, of course. I’m fairly certain they have child sizes but we didn’t check that specifically. We did the 3 cenotes of Cuzama yesterday and we loved it. Thanks for the tip! We took a collectivo from Merida (price 27 pesos) and after that a motorbike/taxi to the cenotes from Cuzama center (price 20 pesos per person). The price of the cenotes trip with the horse and traincarthing was 400 for a group. So the price increased since you guys went there. But it was totally worth it!! We went to 2 big cenotes and 1 small one. We would definitely recommend it. We’re thrilled to hear that you had a wonderful time exploring the cenotes! Taking the horse cart was certainly a highlight for me. Thanks for sharing your experience and providing an update on the prices! This looks like such an amazing and unique experience! I will definitely be visiting these cenotes on my trip to Merida in two months. Is it possible to take a colectivo or bus from Merida to Cuzama, if I don’t have a car? If I do rent a car, what agency did you rent from and would you recommend them? It was one of our most memorable adventures in the Yucatan! You can get to Cuzama by rental car, bus/collectivo, or tour. We rented our car from Easy Way (Calle 60 484, Centro, 97000) and had no issues. You can get to Cuzama by bus or collectivos but I don’t have the exact details. 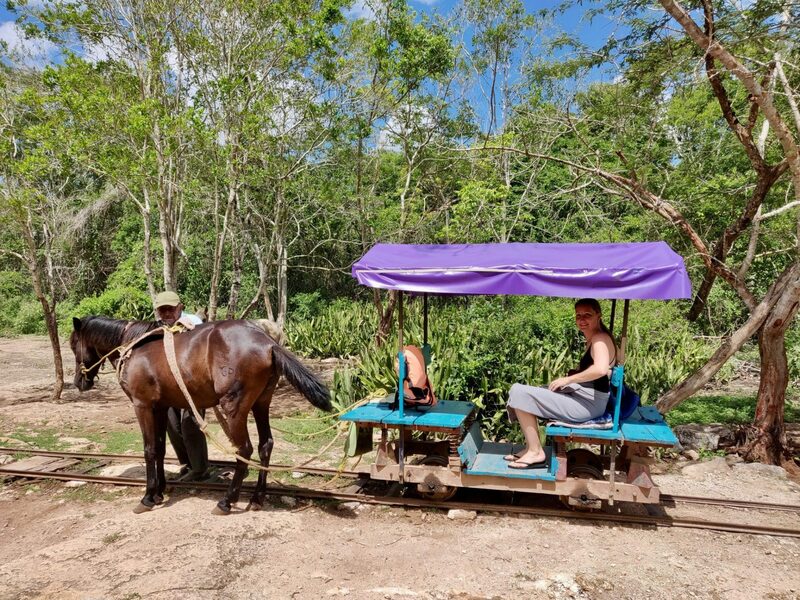 Do know that they only go to Cuzama town, so you’ll need to either walk or get a bicycle taxi (cheap) from town to go the 2-3 miles to the hacienda where you connect with the horse carts to the cenotes. Lastly you can take a tour from Merida, which may run about $50 for the day. Hello! I’ll be in Merida in about 3 weeks and I was hoping to plan one of these excursions while I’m there. Do you have any point of reference to these kids/gentlemen who could lead me to those awesome places? Thank you! If you have a car, its pretty easy to get to. Drive out to Cuzama and once you get to the center of town make a right on the road to Chunkanán. Its only about another 2 miles past town and you’ll arrive at an old hacienda, where you’ll find people ready to take you on the horse cart to these cenotes. Just be sure you go all the way to the old hacienda. When we went, there were people with signs for the cenotes flagging us down and trying to stop us before the hacienda. We were warned about them and told not to stop and instead proceed all the way to the old rundown hacienda. So be sure to ignore them as well if they’re still there. I hope you make it. Its a really unique experience! We did stop at the first turn off with the guys flagging people down… It was a wonderful excursion. The most gorgeous of cenotes. The start of the tour was a bit spartan, (no hacienda) just a snack shack and the outbound tracks. The people were terrific and we had a great time until, after getting back to the start of the tour I discovered my car keys were missing. The local group went out and looked for them at all three cenotes to no avail. They then said they would go down the road to the next group and see if they were there. They came back and said that the keys were there, but the guy with the keys would not give them the our guy saying the keys may not be mine. So I got on the back of a motorcycle with my rental agreement and rode down there to see this big fat drunk with my keys. Bottom line, he wanted 200 pesos for the keys….. I said come back to the other parking lot with us and unlock the car to prove it was mine and I would give him 300 pesos. He said no and he didn’t think the keys were mine. I said ok than Policia. He started screaming in Spanish. We got the Policia and took a ride back in police truck where they had to surround this guy to get the keys back while my wife screamed at him in Spanish, she is Hispanic and also quick tempered. The police told us he was one of the people in charge of the horse carts for the Hacienda and had a gripe with the people from the other site and wanted to make an example. Anyway we all got back to the first site and had Cerveza and refrescos. Quite a story, apparently this feud is on a scale of the Hatfields and McCoys. Still had a wonderful time…. Oh wow! What an experience! Thanks for sharing. I’ve heard about this feud and your experience definitely confirms this “Hatfields & McCoys” dispute. I have heard (not confirmed) that the dispute involves who actually has the land rights to these cenotes and the trails leading to them. Also heard that the hacienda/horse-pulled tour of the cenotes recently lost access to one of the three cenotes and now only visits two of them (again, unconfirmed). Seems from your experience that this feud is strong and enduring! Despite all the trouble you went through, am so glad to hear that you ultimately got your keys back and even ended with a few cold cervezas! 🙂 What a story!